The team that brought you Smashburger and Tom’s Urban 24 is back, this time with better-than-fast-casual pizza. Like Chipotle but with pizza, Live Basil Pizza is set to take Denver and the rest of the country by storm with the delicious and lightening quick pizzas. Walk up to the counter, either order a pizza creation they’ve already got or create one of your own, watch the team make your pizza in front of your eyes, and then watch and wait as the hearth oven cooks your pizza in 150 seconds. By the time you pay for your meal, the pizza is boxed and ready to be devoured. 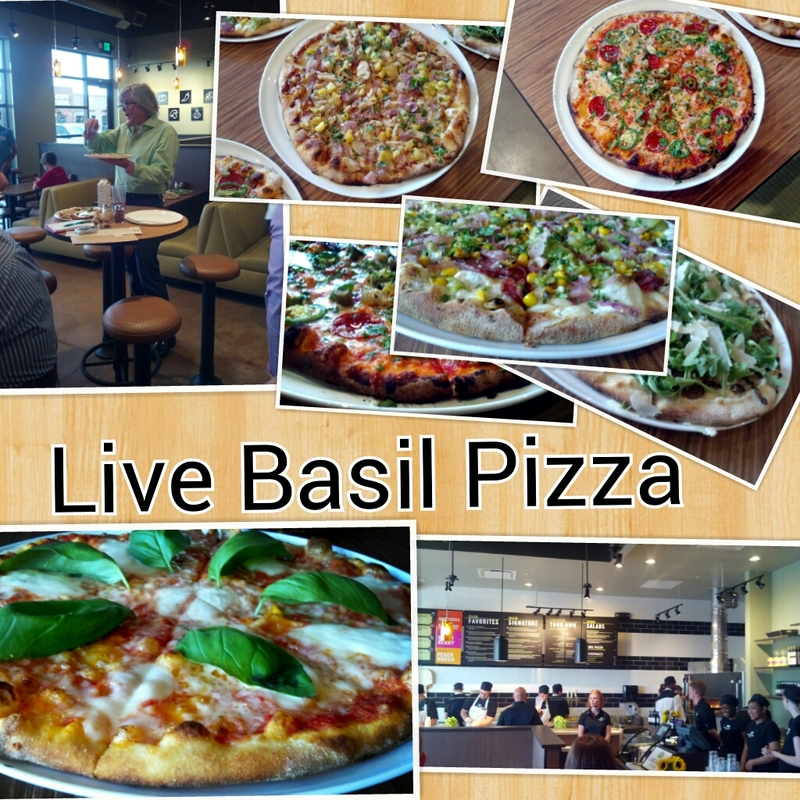 Super cool Live Basil Pizza photo montage! With unique pizza combinations like the Carbonara (white pizza with an Italian cheese blend, herbed whole milk ricotta, Kurobuta ham, imported olive oil, and crack black pepper) and the Colorado (white pizza with Italian cheese blend, goat cheese, bison sausage, fire-roasted Hatch green chiles, herb-roasted red onions, roasted sweet corn, imported olive oil and fresh cilantro), Live Basil Pizza is so much more than the average chain pizza. And with pizza’s pricing out at $8 for a 6 slice individual 11” pizza (you’ll be full if you eat the whole thing), it’s great for the whole family or you can share multiple pizzas with friends. They’ve also got a few salads to choose from, as well as super fresh smoothies made with only two ingredients: fruit and Haagen-Dazs sorbet. Live Basil Pizza is the brain child of Tom Ryan, who not only started Smashburger and Tom’s Urban 24, but was also the Chief Concept Officer for some big-time food organizations, coming up with innovative products like Stuffed Crust Pizza, the 99 cent menu and McGriddles (Yes, this guy INVENTED the freaking McGriddle. Hero status). Now he’s taking on pizza just like he did with burgers, and I can’t see this venture ending any differently than Smashburger. Super fresh ingredients, casual, fast, cheap, and good. The first Live Basil Pizza location is open on East Hampden Ave right off of I-25, and a second location is opening up in Federal Heights in the near future. Their plan is to have 100 locations nationwide within 4 years, each with possible local pizza toppings depending on the area. 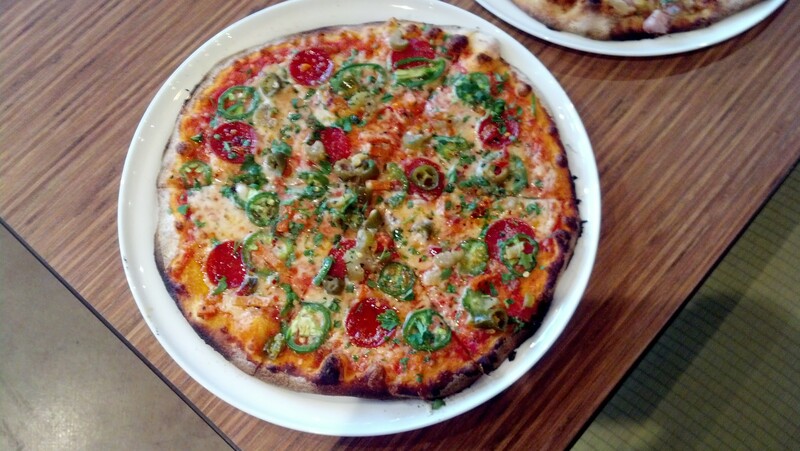 Is it the best pizza we’ve ever had? Of course not (shout outs to Buddy’s Pizza in Dearborn, MI & Grimaldi’s in Brooklyn, NY). But in the same way that Chipotle isn’t the best burrito you’ve ever had. But it’s fresh, and it’s cheap, it’s about to be on every third corner in Denver in the not-too-distant-future, and it’s pretty darn good. Just like all of those other fast-casual places you go to, it’s a no-brainer. We’ll definitely be back.